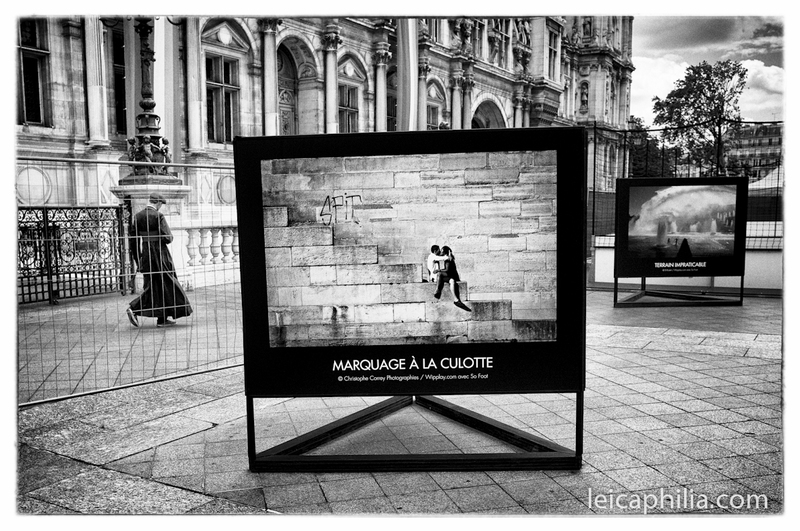 Ironically, competent photographers who’ve spent any time in Paris with a camera know it’s an incredibly difficult place to take interesting photographs. This is because it’s easy to fall into cliched ways of seeing your experience there – you know, the lovers kissing on the Pont des Arts, the guy with the baguette and the beret, the view from a table in a boulevard cafe, the pretty woman in a dress with the toy poodle on the rue, the de rigueur photo of the Eiffel Tower somewhere in the picture as a trope that says “I’m in Paris!” Please. Good enough for a cafe exhibition in Indiana? Probably. Been done a million times? Most certainly. Am I begrudging those of us who’ll be in Paris once or twice in their life and want to record their experiences for posterity? No, of course not. What I’m saying is this: if you aspire to say something with your photography, aspire to say something about you. How you do that is not by recycling tired cliches that represent the stale vision of others, however scenic they’ve proven to be, but by presenting what you see and how you see it. To do that you don’t need the beauty of Paris. You need your own sense of aesthetics and interests, developed and cultivated with your particular vision. Cliched tropes can often be a barrier between you and the richness of the potential experience in front of you, something that restricts your ability to really recognize the breath and intricacy of what you’ve come to see. Looking for that perfect picture of the Eiffel, you can miss the quotidian beauty that’s all around you. Of course, the same thing can be said for the overly familiar; we can become habituated to a place and not really see it anymore. 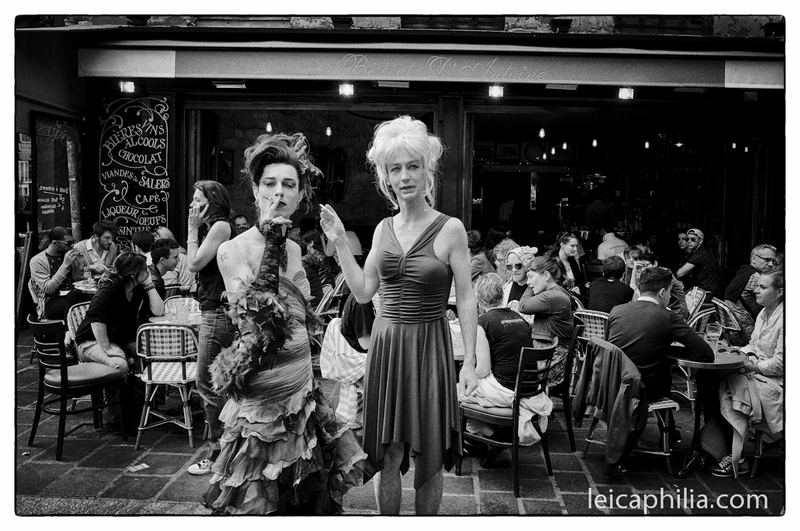 When in Paris I stay with a good friend, a lifetime Parisian. He’s also an exceptional photographer, his work exhibited around the world. In the room in which I stay there’s one of his B&W prints on the wall, a simple street scene in some non-descript lower Manhattan neighborhood. I was with him when he had taken the picture; it was of a scene I’d passed a million times, nothing scenic or remarkable, something I didn’t “see.” But he did. It’s a reminder to me that I don’t have to go to exotic places to find things to photograph. They’re there, everywhere you are. 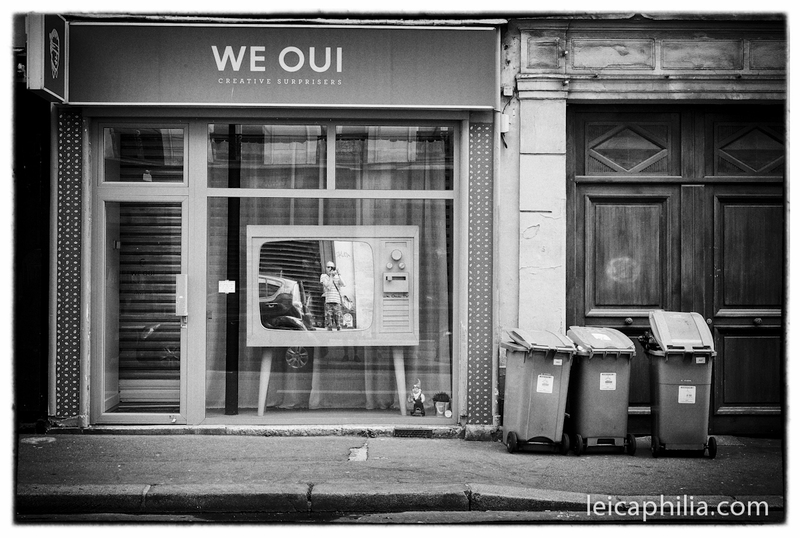 *All photos taken with an M8 and a 35mm Summicron. 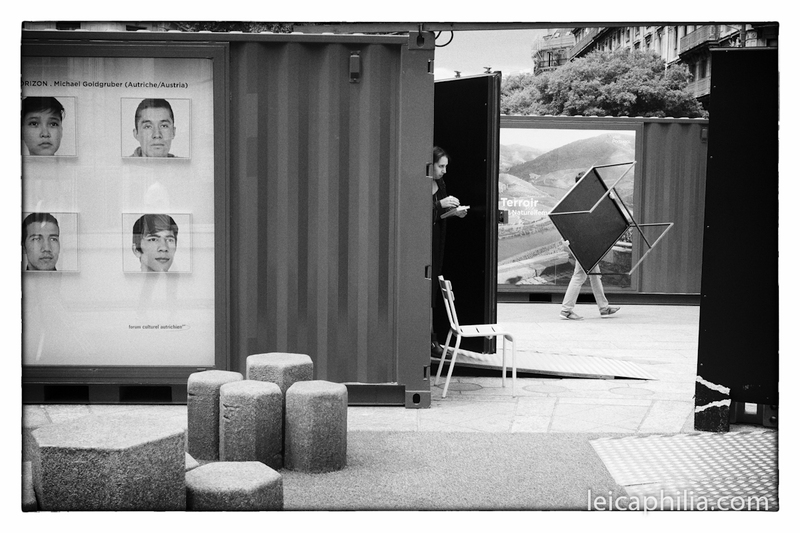 As this was a personal trip for personal reasons, I left the film Leica and the 50 rolls of HP5 at home. Actually, I really enjoyed using the M8. Still a great camera for what it is. 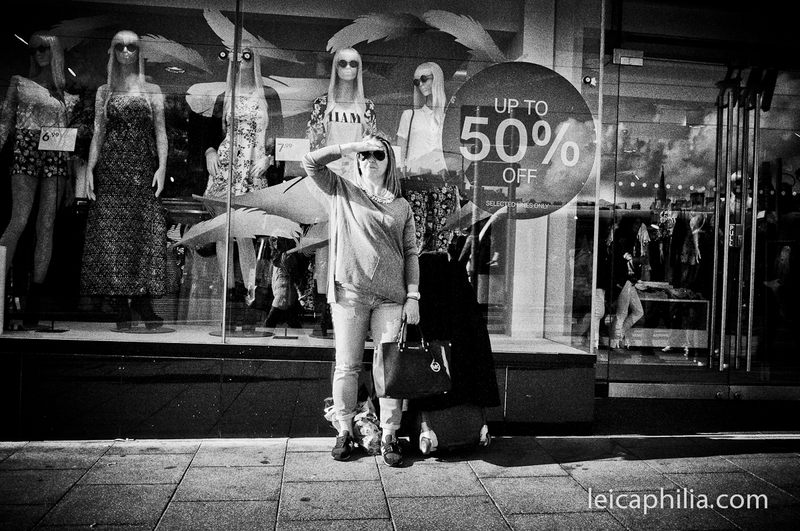 I certainly can’t see why you’d need anything more if your interest is a digital rangefinder. 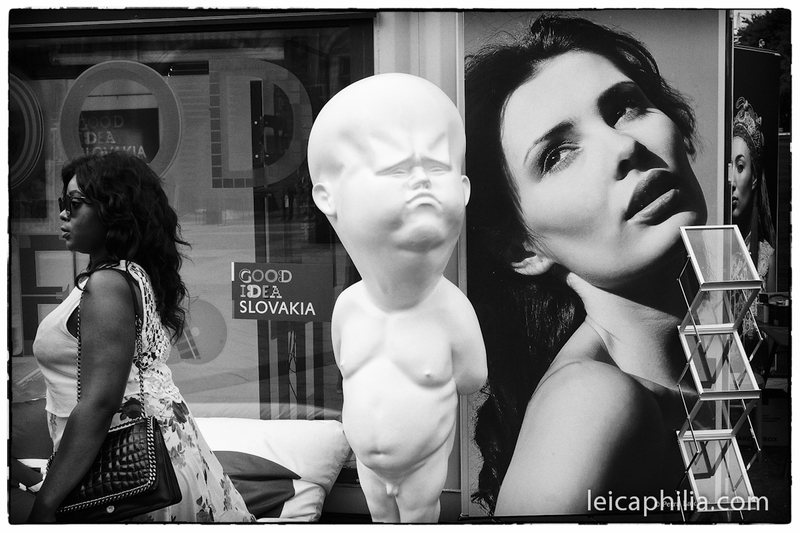 This entry was posted in leica street photography, Philosophy of Photography, street photography and tagged Leica Street Photography, Travel Photography on July 8, 2016 by Leicaphila. Robert Frank called photography an art for lazy people, and I agree with him, as far as that goes, especially in the digital age where you can point your automated camera at something, apply some funky filter with the push of a button to what you’ve captured, and send it out on social media for the world to see, a finely finished product with nothing much to say. It’s actually saying something that’s difficult. Successful creative works are never the product of technological factors. They make no concessions to current taste and listen to no counsel but their own. This is not to say, however, that there aren’t foundational skills you need to master as a precondition to saying what you want to say. Developing the skill sets necessary to be creative is rule based. Once you understand the rules, you’re better able to get out of your own way and let the process and your own creativity bring you to someplace unexpected. Likewise, slavishly ape-ing others isn’t going to get you there either. Emulating either the conceptual or formal decisions of other photographers will not teach you where those decisions come from or how they were arrived at, but is merely a shortcut to your own creative solution, since your mentor has done all the legwork. Structured creative guidelines can easily become comfortable formulas that inhibit unanticipated solutions. A photo workshop is a bus tour; real creativity comes with the unstructured walk. The solution to creating your own vision is to identify and observe the “rules” and then learn to break them. Creativity arises out of the tension between the rules and your imagination. But don’t confuse true creativity solely with a false concept of “originality.” Enduring, authentic aesthetic choices are rarely without some stylistic antecedent, but are historical and culturally specific, grounded in cultural tradition. So look at other work, lots of it. Not just any, however, but the stuff that’s lasted, that’s remained relevant across constantly changing, ephemeral fashion. You can’t move your thinking beyond an established aesthetic if you don’t know where that aesthetic begins and ends. On the other hand, too close of a focus on a given aesthetic can result in a closed perspective. Originality can only exist with a standard from which to deviate. So, the “rules” are pretty simple when it comes to creative pursuits: Learn to use your tools. Learn the formal and conceptual ideas that govern the use of those tools for your given creative end. Learn the history of your medium and acquaint yourself with the best of what’s previously been done in the field. Then, ignore it all and take your own way. 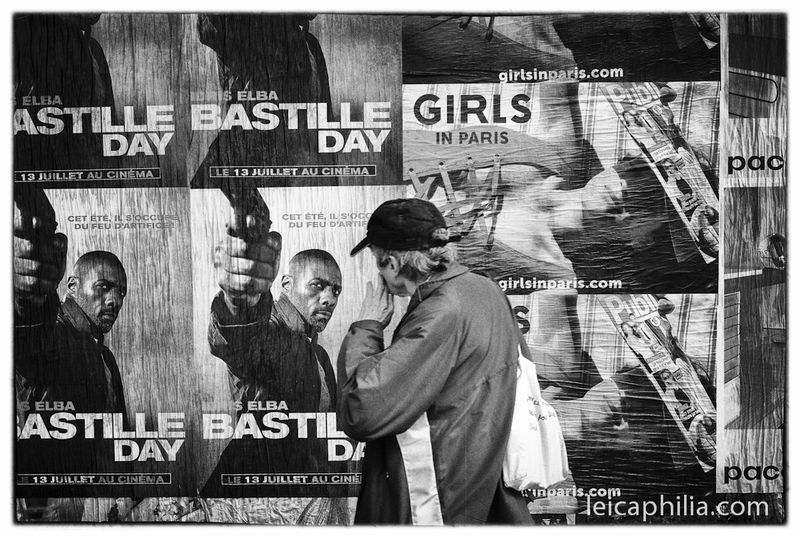 This entry was posted in Documentary Photography, Philosophy of Photography, street photography on February 13, 2016 by Leicaphila. Let me preface this by saying …I like Eric Kim (http://erickimphotography.com/blog/). 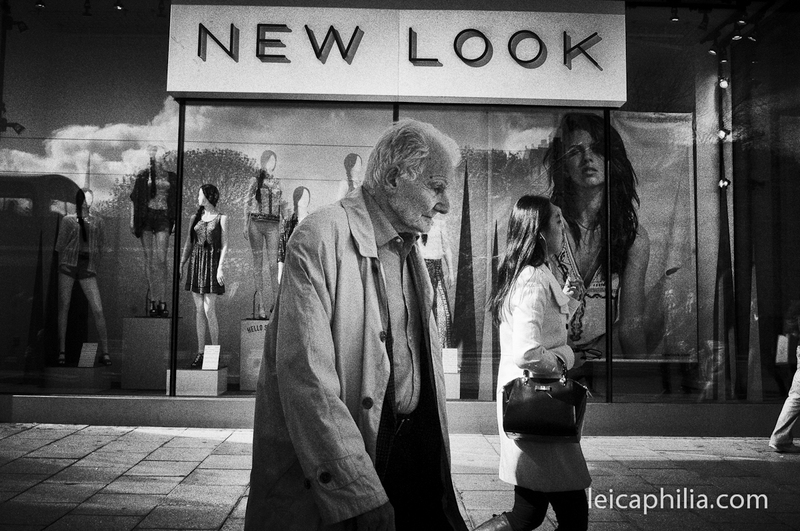 He’s the guy who writes a photography blog with heavy emphasis on street photography and using Leica cameras. He’s earnest, enthusiastic, a decent writer, a better than decent photographer, and he’s stuck his neck out there and is living the life instead of simply sitting in front of his computer pontificating about things he really has no business pontificating about. He admits his ignorance when necessary, and in spite of it, has many interesting things to say and says them in an interesting way. But man, is he a Babe In The Woods or what? 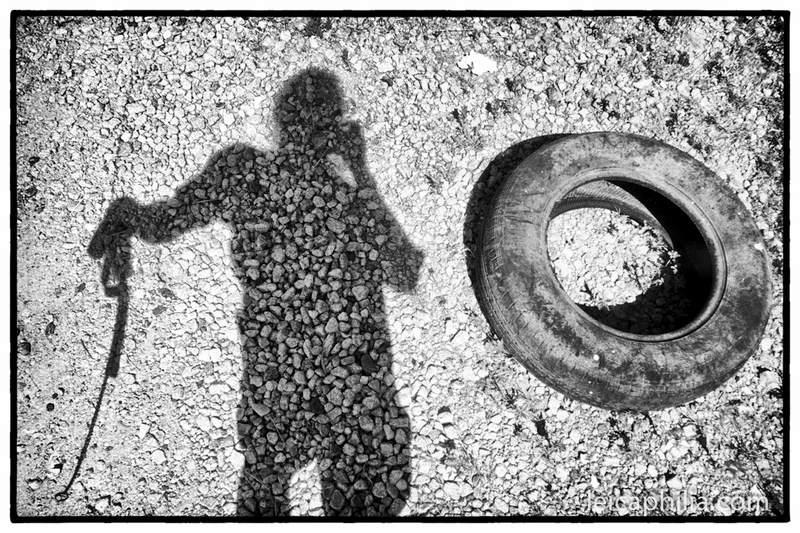 It seems like every other day he’s singing the praises of some “new” photographer he’s discovered or been introduced to, historical figures like William Eggleston, Garry Winogrand, Josef Koudelka, towering figures in 20th century photography who should be known and understood by anyone with more than a passing interest in the craft. Given he’s apparently still in his twenties, I suppose that’s understandable. We as lovers of the craft of photography don’t come fully formed from the womb. We learn this stuff as we go along, and the older we are the more time we’ve had to pull it all together and see photography in its broad historical contours. But, I admit, sometimes his earnestness and naive enthusiasm, coupled with the obvious holes in his knowledge, make me chuckle. If I’m honest with myself, however, its the chuckle of a jaded and slightly bitter aging guy who thinks he knows everything and believes that photography ended with Josef Koudelka and his M4 and that it’s all been downhill from there. So feel free to pat me on the back the way you’d do that slightly crazy uncle of yours who insists on buying a big Lincoln sedan because he likes a “plush ride” and believes Americans still make the best cars in the world. But hear me out for a minute. A few years ago, Mr. Kim apparently had his Road to Damascus moment, and since that time has been forcefully advocating for using film cameras, Leica film cameras, for street photography. Apparently, after having cut his teeth photographically wholly in the digital age, a friend tossed him an M6 and a roll of HP5 and he caught the film bug. From that time forward, film photography became for Mr. Kim the best.thing.ever. Nothing wrong with that (I too am a dyed-in-the-wool film guy and use it as my preferred medium). But I think it’s completely wrong if we’re talking about the relative merits of film vs. digital as the preferred medium for street photography. If ever digital had an advantage over film capture its when shooting on the street, because the sad reality of the street enterprize is that it’s almost all down to chance – shoot everything and find the jewels later. Set your camera to 1600 ISO, use aperture priority metering, set the f stop to f8 or f11, use a manual focusing lens and scale focus, walk the streets and point your camera at interesting things and shoot. You don’t even need to bring the camera to your eye; better to be watching the street drama as it unfolds, with your own two eyes. Easy peazy. Load the 100 photos you’ve taken that afternoon into Lightroom and find the two or three that resonate with you. Work on them until they’re polished raw. 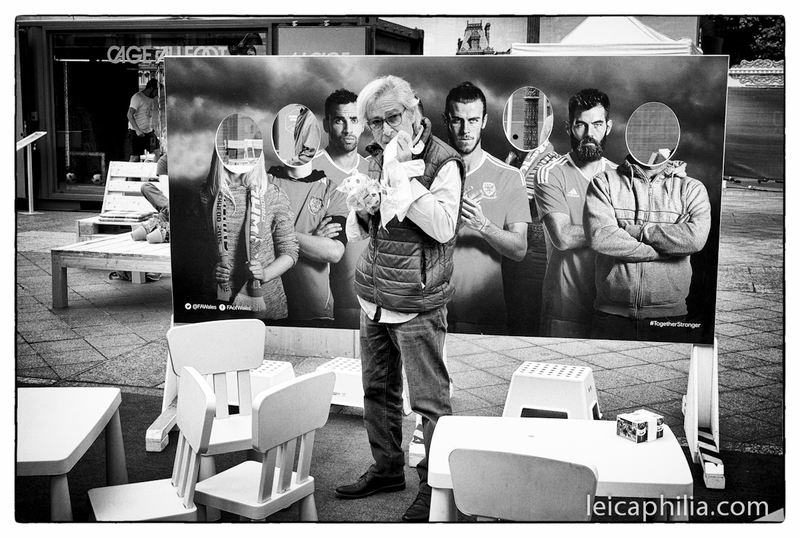 Voila!, you’re a street photographer. 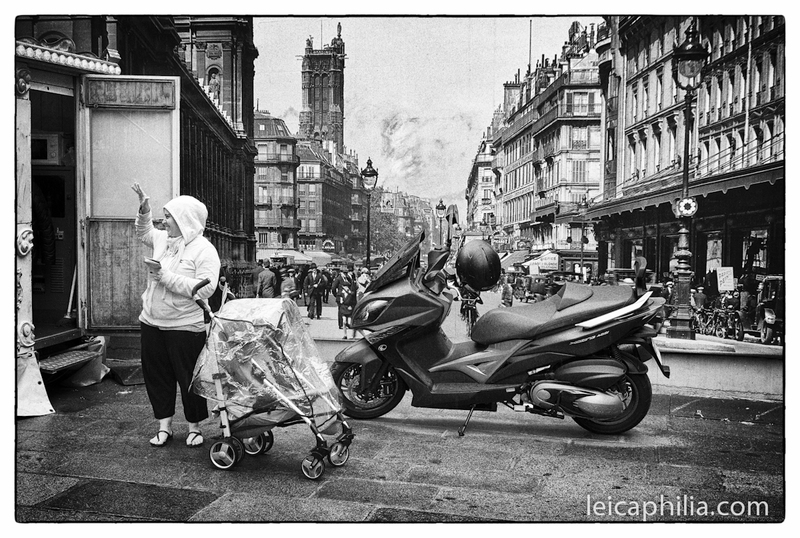 Think Winogrand, not HCB. 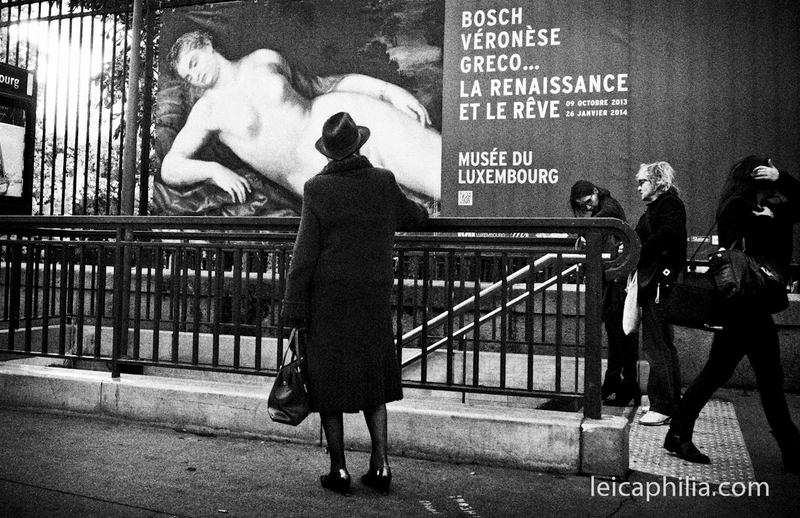 HCB wasn’t a street photographer. He was a artistically trained photographer searching for aesthetic form over content, in spite of all the philosophical claptrap about decisive moments. He actively composed. That’s not street photography. Street photography is Winogrand and the point and pray approach (if you don’t think Winogrand employed the point and pray approach, take a look at his contact sheets, and explain to me how he ended up with 50,000 rolls of undeveloped film in duffel bags at his death). Trust me, if you commit yourself to the quixotic attempt to do that with a film camera, you too will end up with duffel bags of undeveloped film when you die. The difference between you and Winogrand is that your heirs will likely throw the bag into the bin straightaway within days of spreading your ashes. So, I’ve got to shake my head when I see Mr. Kim is giving “street photography seminars” rocking his M4, apparently with the blessing of Leica no less. I guess if you’re insecure enough, or dumb enough, to think that walking around for two days with Eric Kim and a bunch of shutterbug chiropractors taking pictures of dogs leased to cafe chairs is going to be a significant learning experience for you, knock yourself out. Its your money. Frankly you have every right to burn a pile of it in your backyard firepit if that’s what makes you happy, assuming of course that its yours. Who am I to tell you how to spend it. But don’t fool yourself into thinking that paying a bunch of money for the privilege of a day or two chasing after Mr, Kim, or anybody else for that matter, with or without a Leica film camera, is going to teach you anything of significance or up your rate of keepers. Heres what will: Expand your intellectual and aesthetic horizons. – Read. Read all sorts of things that ostensibly have nothing to do with photography. Read about Albrecht Durer, Vincent van Gogh and Jackson Pollock. Read Will Durant’s 11 volume Story of Civilization. Read Fernando Pessoa’s The Book of Disquiet. Read Rimbaud. Read Miles Davis’ autobiography. Read Lucretius’ On The Nature of Things. But, whatever you do, stay away from the drivel that passes for academic analysis of photography (Yes, Todd Papageorge, I’m looking at you). – Look. Really look at things, without the preconceptions bred into you by habit, laziness and ennui. Go to museums and look at paintings. Look at pictures. Lots of them. Buy expensive photo books by obscure photographers. But avoid the amateurish crap readily available on the net and on photo forums in particular, unless of course you simply want to develop the aesthetic of the great unwashed masses, the herd. Ignore the herd and their dumbed down banalities. -Listen. Take an audio course on Nietzsche, or on The History of the Vikings, or a class on String Theory Made Simple. Get to know Howlin Wolf, or John Coltrane, or Bob Dylan’s Highway 61 Revisited. If you’re really daring, listen to some John Cage, or maybe some old scratchy Louis Armstrong. In short, become a man of the world with broad interests in serious things. 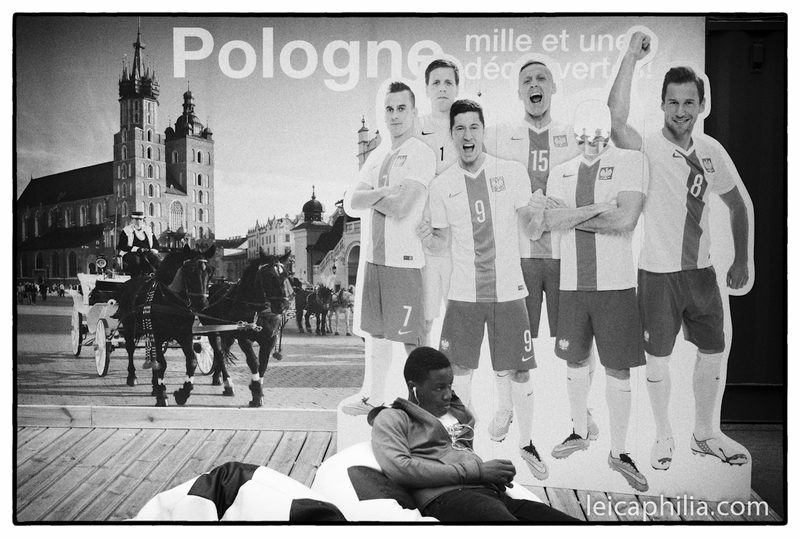 The reason you want to do these seemingly unrelated things to improve your street photography is this: street photography is, essentially, an intellectual endeavor within an aesthetic context. Street photography, as opposed to photos of people on the street, is about those in-between moments that pose a puzzle, that evoke a memory or bring to mind a connection to something else that makes you think. The deeper the cultural and aesthetic well you can draw from when viewing photographs, the more evocative they will be for you as a viewer, and, in your work itself you’ll be better able to identify those products of serendipity that might actually speak to something more than the topical. Being broadly educated in addition to being astute and knowledgable photographically creates a synergistic effect that will show in your work. It’ll enable you to better recognize whatever it is that makes this photo, of this something in the public sphere, resonate for you and hopefully for other likeminded viewers. Just remember, the seduction of the best photography resides not in the photo but in the head of the viewer. So, with all of that in mind, here’s what I think you should know to be a street photographer: by all means, use a digital camera so you can shoot a lot. Throw a wide net by using a wide lens; I personally love to shoot with a Ricoh GXR with Leica M-Mount sensor and a 21mm f4 VC that, given the APS-C crop factor, gives you a real focal length of 32mm. 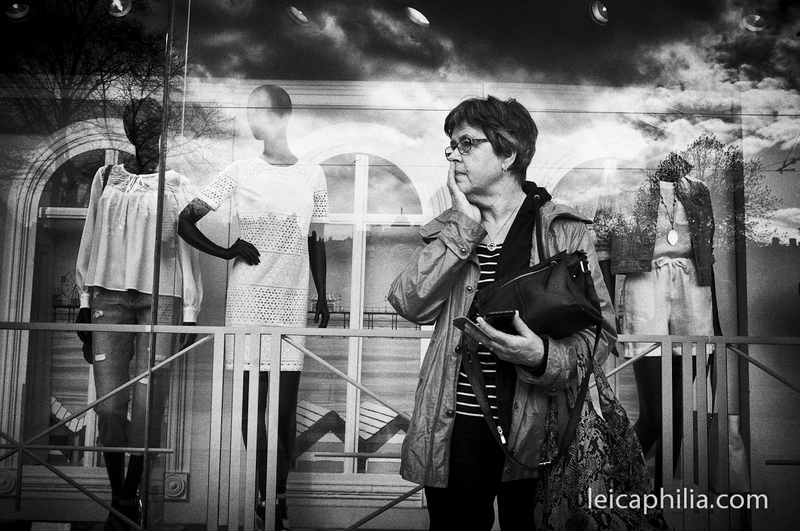 If you insist on a Leica, use a digital M and avoid the prosumer models with their shutter lag and AF. Jack the ISO up to 1600, set the camera to aperture priority and f8, and set the focus short of infinity but long enough that the hyperfocal ability of the lens at f8 effectively keeps everything from up close to infinity in focus. (If you don’t know how to do this, read up on what those f stop scales adjacent to your lenses aperture ring on your camera lenses are for). Now go out and shoot. Point and pray and be proud of it, and secretly look down your nose at the bumbling dilettantes who require sharpness and exactitude and are banging their heads over missed shots due to shutter lag and lazy autofocus. They don’t get it. You do. 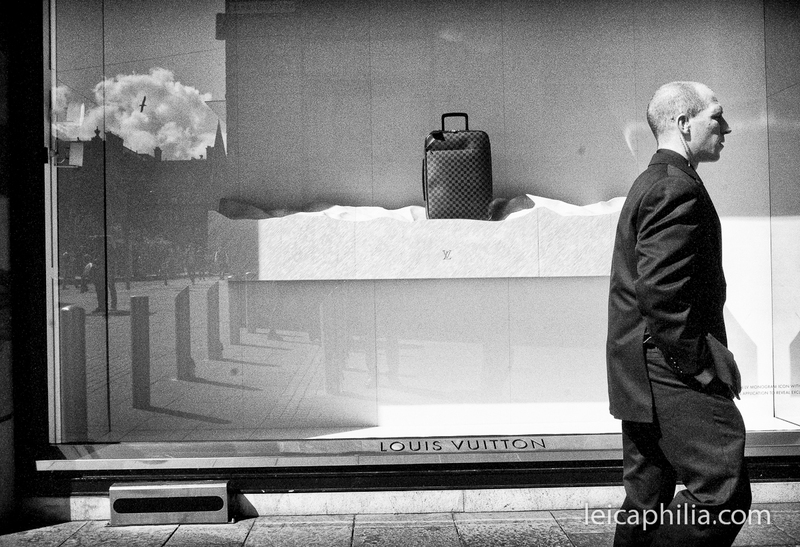 You’ve learned to embrace serendipity, for it’s the heart and soul of street photography. Its when you get back to your digital darkroom that the real work begins. Out of those hundred shots you’ve taken, you might just find one or two that might hint at something more than the topical. That’s where your broad palette of learning comes in. But be critical in what you ultimately show. Ask yourself: does this say something to me? Or am I trying to impress others? Throw away every picture you like simply because you think it will impress others. And for God’s sake, don’t think you need to pay Eric Kim a bunch of money to establish your bona fides. And remember: digital photography is what’s made this all possible. 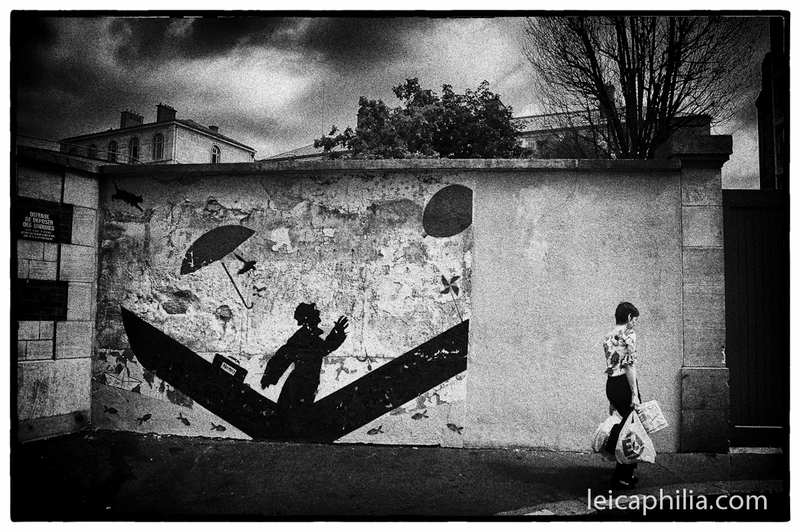 This entry was posted in Documentary Photography, eric kim, Film photography, leica street photography, street photography, Uncategorized on November 12, 2015 by Leicaphila.